The ocean has long been a source of economic livelihood for billions of people worldwide. According to the Organization for Economic Co-operation and Development (OECD), oceans contribute $1.5 trillion annually in value-added to the overall economy. Adopting this approach to oceans and waterways, the Blue Economy portfolio is worth over three billion dollars. According to the World Bank, the blue economy is the “sustainable use of ocean resources for economic growth, improved livelihoods and jobs, while preserving the health of ocean ecosystem”. In the neighbouring countries of India, Sri Lanka and the Maldives, over 16 million people depend either directly or indirectly on marine fisheries, fish farming and inland fisheries as an economic activity. The three countries have seen a steady increase in fish production over the years. India with an annual production of about 11 million tons is currently the world’s second largest fish-producing nation according to statistics for 2017. The legal framework governing uses of the ocean by individual states was codified in the United Nations Convention on the Law of the Sea (UNCLOS) in 1982 and UN Fish Stocks Agreement in 1999. Accordingly each coastal state’s territorial sea limit is 200 nautical miles from its baseline known as the Exclusive Economic Zone (EEZ). 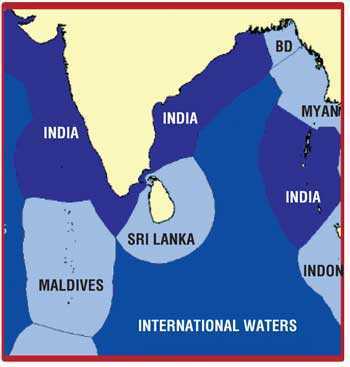 The combined EEZ of the three neighbouring countries, India, Sri Lanka and the Maldives, could be around 3.887 million sq. km. A noteworthy fisheries agreement for India is the Southern Indian Ocean Fisheries Agreement (SIOFA) signed in mid-2006 and enforced in 2012. Among India’s 14 coastal states, the states of Tamil Nadu, Kerala, Gujarat, Andhra Pradesh and the islands of Lakshadweep, Andaman and Nicobar take precedence in fisheries development while more than 3,400 villages rely on fisheries-related economic activity. India’s seafood exports in 2016-2017 amounted to $ 5.78 billion with its third largest destination being the European Union (EU) with a share of 16%. Hence, the EU’s new Common Fisheries Policy (CFP) addressing economic, social, and environmental sustainability becomes vital for two-way trade in fisheries between India and the EU. 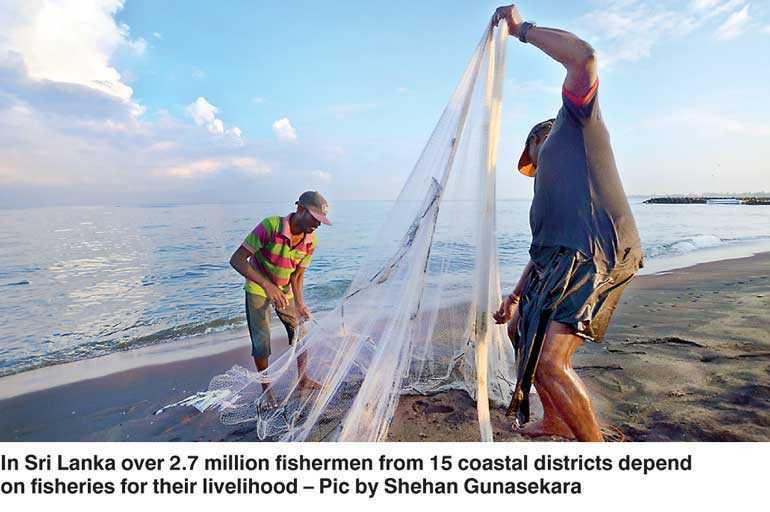 In Sri Lanka over 2.7 million fishermen from 15 coastal districts depend on fisheries for their livelihood. Operating from 25 fishing harbours, they contribute to an annual estimated fish catch of 530,920 metric tons accounting for 1.3% of the country’s Gross Domestic Product (GDP). Income from fisheries exports was $ 256 million in 2017. As a strategy for fisheries development in the country’s EEZ, a Five-Year Fishery Development Plan was launched in 1979, aimed at increasing fish production, maximising employment opportunities and raising the income and living standards of fishermen. Sri Lanka’s fish exports faced a massive blow in 2010 when the country faced an EU ban and the removal of Generalised Scheme of Preferences Plus (GSP+) facility. This facility allows Sri Lankan exporters duty free access to EU countries. The reversal of the ban in 2017 could help the country achieve its target of $ 1.5 billion from sea food exports in the coming four years. Another serious concern for Sri Lanka’s fisheries sector relates to poaching in Sri Lankan waters by Indian trawlers resorting to bottom trawling which entails scraping the seabed. Despite the 1974 and 1976 treaties demarcating the International Maritime Boundary Line (IMBL) between Sri Lanka and India, Indian fishermen have been habitually transgressing this line threatening the livelihood of Sri Lanka’s fishing community. In Maldives the fisheries sector is a major driver of the economy contributing to seven percent of the nation’s GDP. With a total fish production of 48,399 metric tons in 2016, it is the second largest industry in the island nation. Fisheries have traditionally been the main occupation and major livelihood of the Maldivians spread over about 1190 islands. The ocean is thus vital for the economy and food production for small islands like Sri Lanka and the Maldives and to the coastal areas of the Indian subcontinent. It assures the livelihood of the population engaged in fisheries and aquaculture in these three nations. Marine resources have the potential to boost economic growth and wealth for these neighbouring countries sharing the vast expanses of the Indian Ocean. Hence, pursuing a strong ocean policy based on common strategic interests that might see trading jointly to enhance the fisheries sector can significantly contribute to accelerating the GDP of the three nations. As such advancing fisheries cooperation between Sri Lanka, India and Maldives could be a step in shaping the direction for regional collaboration in the Indian Ocean.